E74�'10.6" Border Pakistan - India The Monty Python like border-closing ceremony, performed each day on both the Pakistani side and the Indian side of the border, was an amazing ending of three months Pakistan and the start of many months India. We were warned for lots of hassle and baksheesh on the Indian side of the border, but the Indian officials appeared to have improved their behaviour and the crossing of the border went smooth as it should go. Dutch: Een uitgebreid verhaal over de opnieuw verrassend soepele grensovergang. (533 m) The nice thing about Islamabad is that it's only 15 km from Pakistan. This common saying refers to the fact that Islamabad is unlike any other city within a radius of 5000 km and that it is 15 km from its sister Rawalpindi. Islamabad was created 40 years ago and is a very green, quiet and luxurious and a rather Western city. The campsite is located in a park in the middle of the city. We even saw some wild animals passing close to our vehicle and our campfire on one night! (342 m) Toyota Frontier Service is doing the last repairs on our LandCruiser. It took a long time, but they did a miracle job. The car looks like new. (461 m) We were invited by a manager from Toyota Frontier to visit his family in Latamber , a small Pashtun village located in the so called Tribal Areas. The protected life of Pashtun women is somewhat unfamiliar for us Westerners, but the horrifying stories in Western media have little to do with reality. We also hiked into the Salt Mountains and a family trip is incomplete without firing some rounds with an AK-47. Also grandmums pistol had to be tested. In these areas "Stop, or my mum will shoot" should be taken very seriously. (342 m) We have to wait here until our car is fixed. 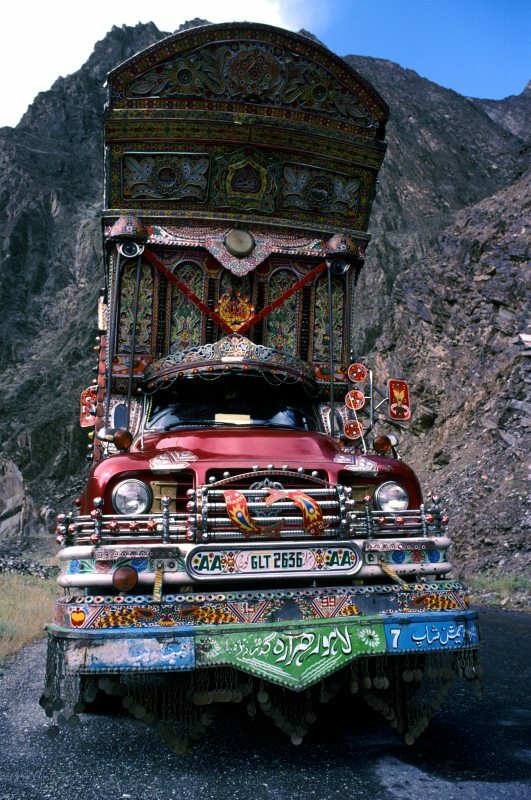 Peshawar is a comfortable city and the magnificent Khyber pass is next door! Opdracht 20 - Mediteren goed voor de mens? (1520 m) We had to wait until transport to Peshawar was available. Watching polo in a mountain scenery almost make you forget the problems of past and coming days! (2088 m) Today our LandCruiser was winched out of the ditch with a lot of help from the Awi village and the Booni police. We owe a lot of thanks to all the people that helped us! Dutch: Het hele verhaal in het Nederlands. View this place in Google Earth. N36�'31.3"
(2112 m) Accident! Heading for Gilgit, we took the road at the wrong side of the river. 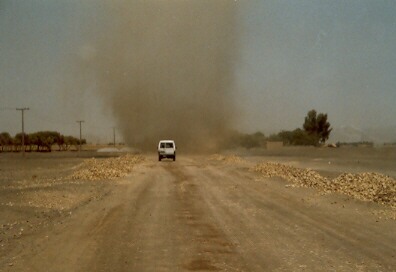 At a narrow turn in this tiny dirt-road our car slide of the edge and fell on its side 2 meters below on an irrigation channel. Due to the crash I lost consciousness for a few minutes and my memory was gone. Only after a few hours sleep my memory returned, besides a gap from 13:30 (an hour before the accident) to 1:00 (the time I woke up after two hours of sleep). (2140 m) The Kalash valley is home to the Kalasha, non-Muslims who claim to be descendent of ancient Greek colonists. The story goes that Alexander the Great was very surprised to find Greeks around here when he came over the Hindukush in 327 BC. Besides its intriguing population, the Kalash valley is also very green and beautiful. Unfortunately, with the Afghan border within 20 km, hiking possibilities are limited for security reasons. (1520 m) A pleasant mountain village with a beautiful sight at the Tirich Mir, with 7706 m the highest mountain of the Hindukush. The Chitral Gol National Park is home of the elusive snow leopard. (342 m) A colourful and comfortable Pasthun city . 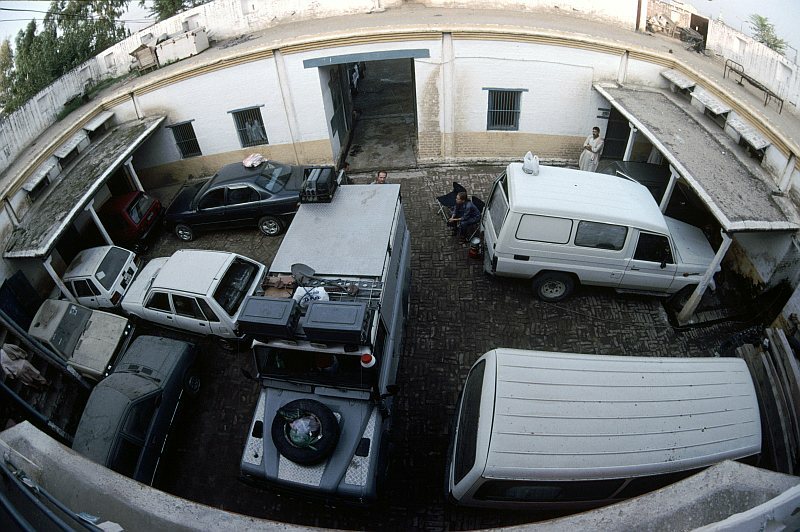 Also home of several UNHCR sites, and UNHCR LandCruisers and tents are everywhere. We are still wondering why the UNHCR uses the most luxury and powerful LandCruisers available instead of the common ones like ours. According to the newspapers many Afghan refugees are wondering the same. For the third time the police showed up just when we had dinner at our beautiful camping spot next to the ancient Buddhist monuments of Tahkt-i-Bahi. Again the argument was that this place was unsafe and that we had to stay at the police-station. Anyway, it was an odd place to camp: next to jail with prisoners looking through the bars and next to a bullet riddled car with fresh blood-spatters inside. The policemen told us that a complete family had been killed inside that car. Nice information to get some good night's rest. (1848 m) A summer-resort for rich Pakistanis. (836 m) The hotels in the twin village Dasu/Komila were just crap and so we decided to camp next to the KKH near some tea-stalls. The owners of the tea-stalls assured us the spot would be safe to stay the night. For some reason the police found out about us and just while we were having dinner they dropped by: it was considered unsafe to stay here so we had to move to the police-station. (1494 m) A few days of rest at the pleasant Madina Guesthouse. (3070 m) Our car almost fell into the river 30 meter below but you get used to this kind of events when driving in the Karakoram. Also watched a mountain village polo match. Superb! (4153 m) Beautiful high altitude fields, the Deosai Plains, offering a superb camping spot. We knew that the glowplugs of our engine were damaged and the night-frost punished us for our imprudency. Furthermore the cold caused a strange car problem: the condensation of diesel vapour in the tank resultated in a vacuum in the tank. It took us two hours to recognise the problem. Just loosen the tankcap and "problem yok" as they would say in Turkey! Dutch: Autopech op 4100 meter. (2366 m) A small peasant village near Skardu. (1494 m) On the way back we gave a ride to a border officer and his broken UPS. Futhermore our car was hit by a falling rock, causing the removal of some paint. Don't worry: as we will later learn a Pakistani policeman helping you parking your car will give more reason to visit a paintshop. View this place in Google Earth. N36�'47.0"
Dutch: Het hele verhaal over de KKH! (2656 m) Next stop at the KKH: another beautiful mountain lake. (2055 m) We planned a full day hiking trip to the glaciers at the base of the superb Rakaposhi (7788 m). Due to bad weather we limited our walking day to an afternoon. (1494 m) Madina Guest House in Gilgit is one of the most enjoyable places of Pakistan. Normally Madina accommodates 30 to 40 travellers. Due to 911 only 8 tourist stayed here, including us! (4300 m) A engineer guided us to the new road he was blasting out of the rocks. Of course, no decent surface yet, but at least no end of life when making a small driving mistake; this blasting new trail was about 3 meters wide. (3677 m) Following a hair-raising rocktrail we reached the settlement of Gittidas. A definition of hair-raising? Simple: it is not possible to open a door of your car. Left: a wall of sharp rock. Right: 500 meters of free fall down to the river below. A beautiful lake surrounded by massive mountains. (1450 m) A lot of hassle to get out of Kashmir and find the right road. Only in the afternoon we arrived at the entrance of the Kaghan valley. An engineer of the Pakistan army directed us to a beautiful camping spot next to a river. (2037 m) Due to a landslide and some misunderstanding we ended up in this Kashmiri hill-station. Officially a warzone as we found out the next day. Hotels refused to accommodate us, so we camped in front of an army base. Dutch: Het verhaal over de KKH tot en met 5 september. (222 m) Just a stop-over. Later we will visit this great city with more interest. 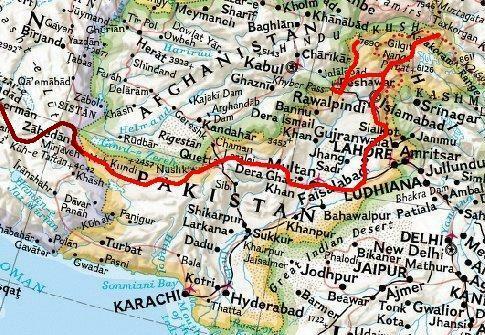 (120 m) The reach the North we have to pass through Multan and Lahore. 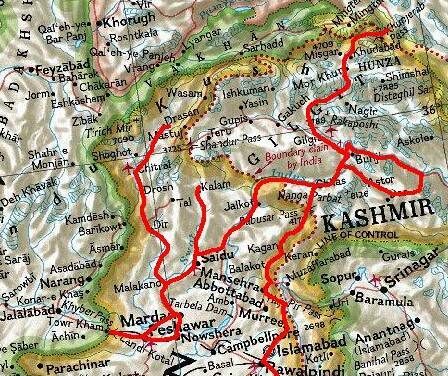 The direct route north is tribal area and not allowed for foreigners (and unsafe). Anyhow, we had some glimpse of the Pashtun tribal dresses. The most funny burka is the one with a small top on the head and coloured white or pink. Not kidding: those women look like walking condoms! (1444 m) Since Bam we travelled with Wendy and Arie, driving in a LandRover 110. The road between Ziarat and Loralai is terrible (average speed 25 km/h) and since Wendy is feeling ill we decided to stop in this nothing-special town. (2613 m) An English hillstation. (1712 m) Was the difference between (Eastern) Turkey and Iran not really big, Pakistan is another galaxy. Chaotic, male dominated streets, bad roads, dirt and garbage everywhere but also less serious and more funny people, excellent food and all Western goodies available. E61�'1.1" Border Iran - Pakistan What do you expect from this border crossing?